Plain wooden cabinets -- painted pink! not subway but 4 x 4's, and the countertop was the same. But we wanted to "age" the kitchen . . .
And we painted them white! 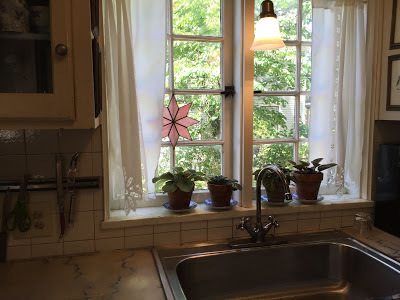 on a homes tour, we had many comments about "oh, they have the original kitchen"! WHO would put an island in a 10 x 10 kitchen? Put in an island way before islands were all that popular in kitchens? But in 1991 it downsized from a whole campus of buildings to just 2. Closed it's kitchen so it could outsource it. Their pastry marble came to Linderhof's kitchen! The perfect countertop for an island! 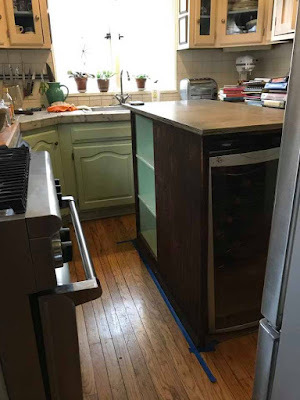 With shelves on two sides and a place for Jim's wine refrigerator in one end. 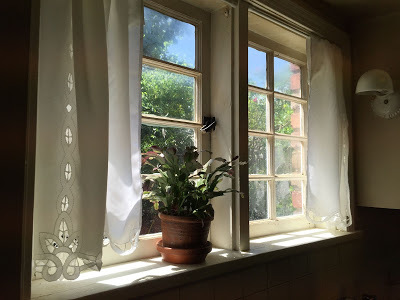 Makes the kitchen feel lighter! Now, of course, I'm mad at myself that I waited so long. Mad at myself that I didn't do it in the first place! I do love my little kitchen. It's a great place to cook. I think it has a great 20s vibe! Your kitchen is a piece of perfection! And think of all the delicious things that have been created in it! It looks great and 20-ish! It looks so beautiful, Martha! I never saw your kitchen before. Mine is 96" sq ft from wall to wall, longer and with a narrower center. That is a wonderful story about the marble. I so would love something like that. Is Victorian girl above our friend from Canada? Its been a while since I have seen anything from her! You’re kitchen is lovely and fits your home so well! It looks so inviting, I bet it’s a joy to cook in. The marble is a real treasure, too. Martha, it's beautiful! I love it. My first apartment in the late 1970's was on the Plaza in Kansas City in a darling little building that's now been replaced by a big high rise. 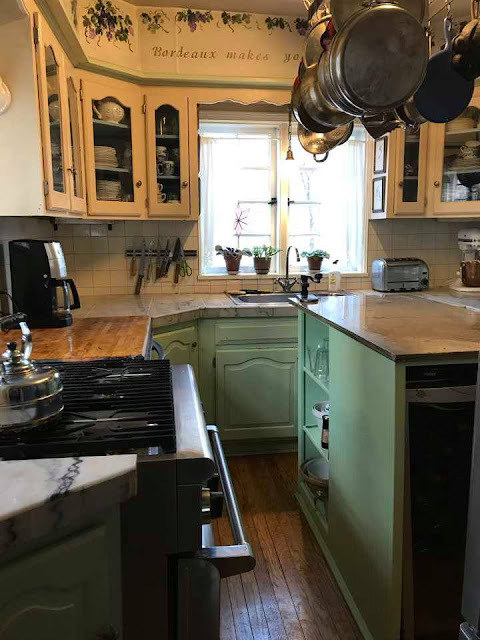 It had the same glass fronted cabinets in the tiny kitchen and tiny dining area, and they were the same green; the owner called it "Yucca green"! Martha, I just love your kitchen! 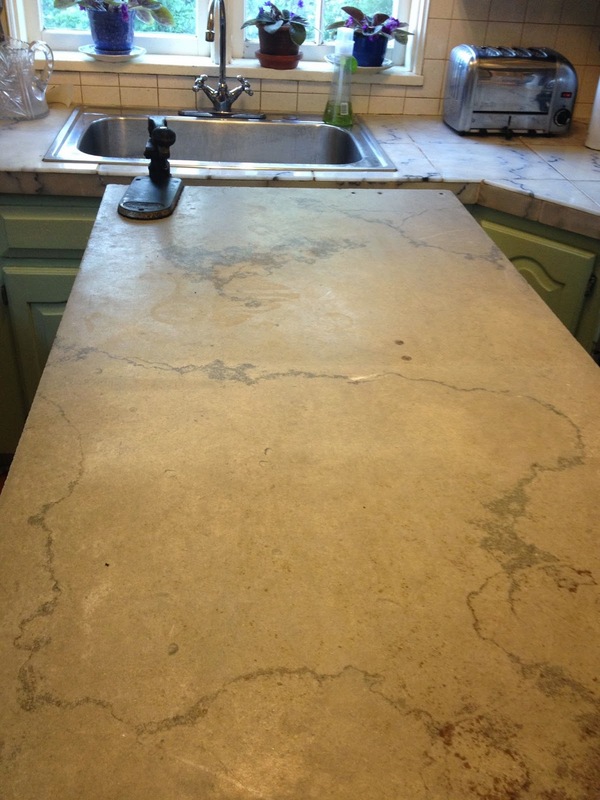 And that marble on the island is so special! A wonderful place for a wonderful cook! Love that perfect green- do you recall the brand/shade? Hi Martha, I don't know why I received this today, but I am wondering if "Victorian Girl" is the former HGTV message board member who lives in Canada?